It’s Valentine’s Day and what better gift than the sweetest gift of all? Cake of course! This is the blend of my two favourite desserts: Strawberry Shortcake and Champagne Cake. 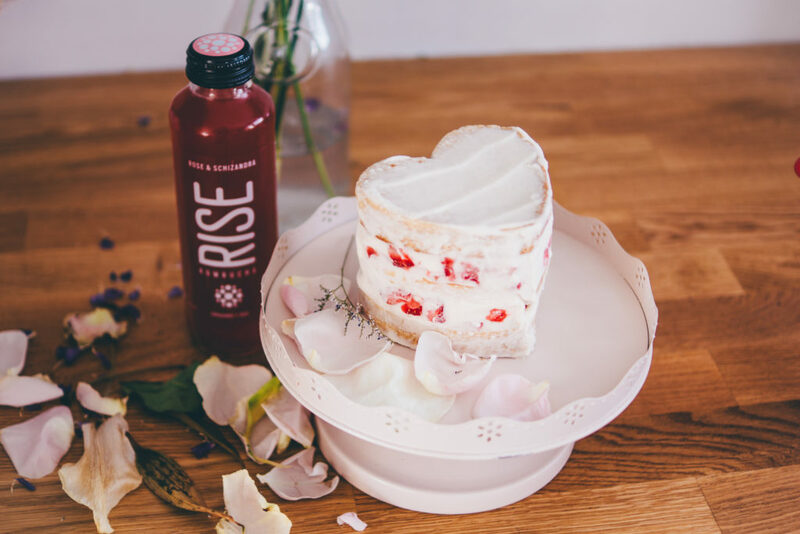 It’s light, it’s fruity and best of all, it’s made with RISE Rose & Schizandra kombucha. Use any vanilla cake recipe and replace half of the liquids with kombucha. You can also skip any lemon juice or vinegar the recipe asks for since the booch is already acidic. Add the wet to the dry ingredients. You might see bubbles forming due to the interaction of the kombucha and the baking soda. It is totally normal! Continue to whisk gently until everything is smoothly combined. Bake at 350 degrees for 45-50 minutes (if in a regular 9-inch cake pan) or insert a toothpick to verify the batter is fully cooked before taking it out. Decorate it as you wish: be creative! Add chocolate ganache, jam, sprinkles, candy… whatever you want! For my cheri-boo, I layered it with coconut whipped cream and strawberries and obviously, it’s heart shaped! Have a great lovers – and gals! – day!